Here is a set of videos that covers Quadratics, Triangles and Squares with Pythagoras and a little bit more. Caution advised this is not a normal lesson nor is it the way you should present mathematics to younger students or even students this age, but because we have deadlines to meet I stuffed a lot more into the hour than usual. This might be good for some teachers/parents and students to see where we are going with all this...we seem to lose track of the destination sometimes when we get caught up in computation. This post should answer some WHY questions that may have been lurking out there. 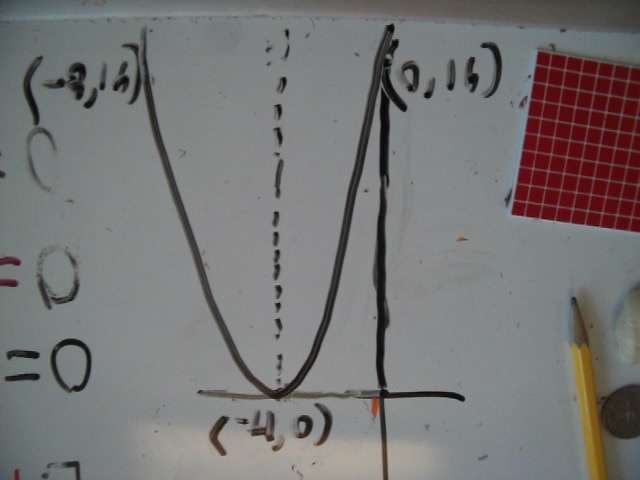 Here is one of the graphs we made while we played around with factoring polynomials...the idea behind it all is problem solving, rational and critical thinking NOT memorizing rules. Note we don't even begin to cover application which means I am still being tricked into teaching backwards. This is the crash course where we cover many concepts all in one hour. When you are teaching little kids you only cover one concept at a time and add more understanding in layers over time. For example you can spend quite a bit of time just playing and building squares. When they are used to factoring, then we can set it equal to zero and find "roots." What do we mean by roots? So we start off with a simple one as a refresher and to make it non-threatening...and then we can start graphing and get more information. Note how the symbols bring up some memories of linear functions for him...and you can see the blending of symbols, blocks, pictures and graphing. 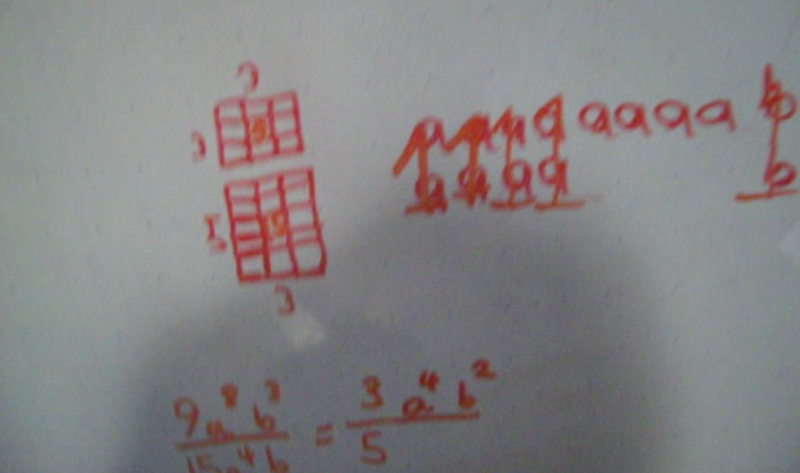 And we also played a bit with fractions and covered the 5 concepts and how they related to everything we just did. You can hear him yawning which tells me we are stressing his attention threshold...good time to quit. No need for drugs or labels like ADD. The lesson went for a solid hour and we covered a lot of ground, MUCH more than you normally would. Stay tuned for more lessons. Playing With Squares Would Have Made Quite A Difference. Here is a quick set of vids on completing the square. You can find all 5 parts here on the Advanced Algebra page. Basically we take playing with squares to the next level and out of necessity we have to cram a lot of info into a short period of time because he has grades to make and tests to take. If he had been playing with squares and building square numbers for a while previous to this, everything would come a lot easier and with less stress. Get your students started early...and by "early" I mean as early as possible, five or six year olds can do a lot of this math as seen on my website and other posts on this blog. For them, you go slow and make a game of it...but they learn and discover all kinds of things that will come in handy here. In a moment it will make more sense. 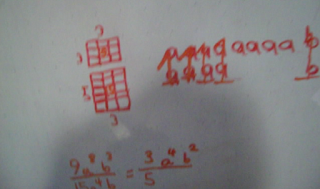 You can see that instead of a red square and blue bars which are the x we have orange twos...the red square is now a two square and the 9 has twos around it because each x = 2 (and of course x² = 4), and 25 = 25...when x = 2. What would get for x² + 6x + 9 if x = 3? And as you can see he has a bit of difficulty so we go back to the blocks and practice some more. Check out this page on completing the square [link not built yet] for the full story, the page contains a link to both the entire 23:30 minute video and the 5 separate videos on a page very similar to this but with a little more explanation and pictures and video and links...that vid cuts off abruptly and you will need a password to get into the pages that contain the rest of it. Here is Part 5 where we do one more problem that looked a little daunting but many of my young students have built that very square just playing on their own. Self directed students often get out four or even nine red squares and put x's and units around them...building bigger squares is fun. They can also see the similarities between x² + 6x + 9 and 169 and see the square root is 13 in the case of 169 and (x + 3) in the case of x² + 6x + 9 and certainly if each x is two then x² + 6x + 9 = 25. In fact substituting for 1, 2, 3 and 4 is no big deal and not scary at all for a 6 year old. But the teen-agers who are being exposed to this for the first time do not agree. Too bad they didn't get to play with these blocks when they were kids. Little kids would just build it draw a picture of it and that would be it. Later we could set it equal to zero or another square number and solve for x. As I mention in the vid, first you introduce the positive root then as they become more familiar with square numbers and integers you can introduce the negative root. 5² = 25 and so does -5². ±5 = 25 is just economy of symbol. Being familiar with the concepts ahead of time solves a lot of problems. For students who are struggling to pass algebra the blocks make the concepts assessable and easy to SEE and therefore understand and remember. Monomials: Play Find The Ones. Monomials can look scary and be confusing for some, but if you make it a fun game they are actually easy and fun. Once the concepts are understood rules can be discovered by the student, not given by you as things to memorize. Here is a poor screenshot showing a breakdown of the monomial with pictures and symbols so that finding the one is easy. Little kids enjoy this game and students with various disabilities can really understand what they are doing and more importantly WHY. Algebra doesn't need to scary or hard. It can be fun. Endeavor to make a game of it whenever possible...make it child's play. At Crewton Ramone's House Of Math there are tons of games and activities to make math fun.